supported by infrastructure and workplaces that actively encourage and develop the public health workforce. Two overarching priorities lay at the heart of the plan: the first was to improve Maori health and the second to reduce inequalities, particularly for Maori and Pacific peoples. All actions implemented as part of Te Uru Kahikatea were seen as opportunities to further these two priorities. Te Uru Kahikatea has two overarching goals that encompass nine objectives and corresponding actions. Objective 1: Establish an integrated, staircased framework of training, qualifications and ongoing education in public health. Objective 2: Strengthen the Maori public health workforce and the capability of the non-Maori workforce to improve Maori health and reduce inequalities. Objective 3: Strengthen the Pacific public health workforce and the capability of the non-Pacific workforce to improve Pacific health and reduce inequalities. Objective 4: Build infrastructure for public health professional development. Objective 5: Strengthen the public health capability of the wider health workforce. Objective 6: Advance workforce planning and capacity building to grow the public health workforce. Objective 7: Strengthen the public health workforce information, policy and research base to inform ongoing public health workforce development. Objective 8: Nurture and develop supportive cultures to achieve optimal workforce capability and capacity. Objective 9: Increase the understanding of, and promote careers in, public health. The work of Taeao o Tautai is driven by Objective 3 and gives effect to the two key actions identified in Te Uru Kahikatea under this objective. 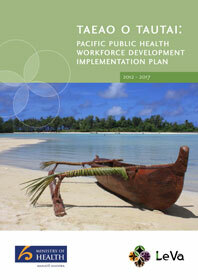 increase the capability of the non- Pacific workforce to improve Pacific health gain and reduce inequalities. Maximise opportunities in all other Te Uru Kahikatea objectives to further Pacific public health workforce priorities. Taeao o Tautai outlines how the Ministry of Health will implement these actions to contribute to better health outcomes for Pacific peoples. In particular, Taeao o Tautai lists the specific priorities, workforce outcomes, action points, and milestones that will be necessary to achieve this. This plan should be considered in the context of other public health workforce development activities, as it aligns with and complements a range of other actions which are being promoted by the Ministry to implement all the objectives of Te Uru Kahikatea.